The Rwanda Union Mission of the Seventh-day Adventist Church offered 15 wheelchairs to people with disabilities, during a special awareness Sabbath organized by Adventist leaders and members in that African nation on May 5, 2018. The theme of the day was “A person with a disability is of great value before God, as anyone else is.” The ceremony was held at Remera Seventh-day Adventist Church, in the East Central Rwanda Conference church region, based in the capital city of Kigali. The State Minister in the Ministry of Local Government, Hassan Bahame, and a Member of Parliament, Gaston Rusiha, who represents people with disabilities in the Rwandan Parliament, attended the event with many other guests. All of them said they were impressed with the care the Seventh-day Adventist Church in Rwanda is giving people living with disabilities. He concluded by requesting that the Seventh-day Adventist Church in Rwanda include people with disabilities in its structure of leadership because they are able. “Nothing for us without us,” Rusiha explained. In his remarks, Rwanda Union Mission president Hesron Byilingiro reminded people that during His earthly ministry, Jesus had the habit of supporting everyone, including people with disabilities. “Any Gospel which excludes weak people is incomplete,” said Byilingiro. He then appealed to all church members to have a heart of compassion and requested all local churches to have a department for Special Needs Ministries. “We want to help them to have a better life, and we will do more in the future,” he added. Church members and visitors left impressed after seeing how talented people with disabilities are. 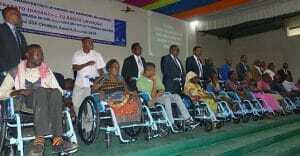 More than one hundred people with disabilities were present at the Remera Church for the special awareness celebration.